The possible role of vaccination crews in introducing disease onto pullet-raising facilities was reviewed at a recent meeting of the American Veterinarians in Egg Production. A survey conducted among health professionals disclosed that most pullet farms are multi-aged with the result that if an infection is introduced at the time of vaccination of flocks aged 10 to 12 weeks there is a high probability that the pathogen will be disseminated among two adjacent flocks aged below 5 weeks and older than 16 weeks depending on the placement cycle. What may be worse, a mature flock incubating an infection which would be clinically inapparent might be transferred to a multi-aged laying complex with severe financial consequences. Most vaccination crews consist of 11 to 17 workers which creates problems unless the biosecurity module is equipped to decontaminate a large crew over a one-hour period by showering. Obviously the farm must supply workers with protective clothing and footwear which again requires either a laundry service or onsite decontamination. Since most pullet rearing operations and integrations use contractors, there is an obvious danger that pathogens can be introduced from the last farm at which workers had contact with poultry. 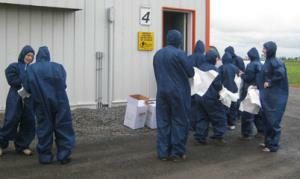 This may include mature hens or pullets if the crew is involved with moving or even insemination of turkeys. Dr. Carol Cardona of the University of Minnesota reported on a simulation study to determine the probability of a vaccination crew introducing avian influenza. The study assumed the likelihood of transmission on a specific day by each member as two percent with 15 workers in the crew. The estimate was based on one crew member exposing only five birds to 20 EID50 infective doses with a 50 percent infectious dose of 10 3.5 EID50. It was also assumed that the infectivity of avian influenza would decline by 1 log EID50 per day at room temperature. 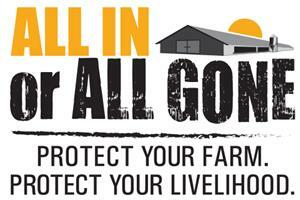 If crews had one day between successive farms there would be a 26 percent likelihood of exposure from 15 workers. The probability of introduction of infection can be significantly reduced by implementing effective operational biosecurity. This requires investment in structural biosecurity including a decontamination module with functional showers, (NOT a Danish-entry change room), fencing, water-impervious roads within the biosecure area of the farm, a vehicle wash installation and all required vaccinating equipment. If a contract vaccination crew is employed, biosecurity should be based on the presumption that the crew came immediately from an infected flock. The biological link can be broken by effective decontamination of personnel. This requires complete disrobing, thorough personal decontamination in a shower and then donning company-provided protective clothing. Anything less is self-delusion concerning the level of protection and an exercise in AI-Roulette.